If you have heard of WDST, Mountain Jam, Taste of Country or Speed of Sound, you should keep reading. What do these four things have in common? Believe it or not, they all started in Long Island on the radio station WLIR. That is where Gary Chetkof started his journey over 40 years ago. 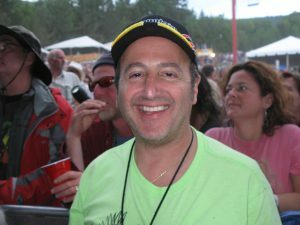 Chetkof, is the owner and president of Radio Woodstock/WDST and the founder of Mountain Jam, Taste of Country and Speed of Sound Music Festivals. Chetkof, like so many others was influenced by FM radio. As a native of Long Island, NY, he dreamed of someday owning his own radio station and producing concerts. Unlike many people, however, he actually achieved his dreams. “When I was in high school in Long Island, I used to attend a summer outdoor concert that my favorite radio station (WLIR) produced. So I envisioned an outdoor concert with people sitting on blankets, throwing a Frisbee, bringing a cooler of food and drinks, and having a fun day in the sun in a beautiful setting,” Chetkof recalled. However before he was able to make that dream come true, he first bought WDST in 1993. Radio Woodstock 100.1 WDST has been recognized by Billboard magazine as being the best radio station in the world many times. It has grown to include listeners all over the world through online streaming. It is known as being one of the first independent radio stations in the nation, as well. His first festival was Mountain Jam and his most successful. It began as an idea to celebrate the 25th anniversary of WDST. “I wanted to celebrate the 25th anniversary of Radio Woodstock/WDST and I thought throwing an outdoor music concert was a good idea,” he explained. Here is how Speed of Sound started. ”Mountain Jam became such a big festival and producing it became quite monumental. So I thought it would be fun to go back to the original concept of Mountain Jam and throw a one day music festival,” Chetkof said. He did it for the 35th anniversary of WDST. It takes place at the Duchess County airport. “We wanted a different location, so we found a small airport near Poughkeepsie, which has a lot of flat land and good parking and is already fenced in. The small planes flying in and out of the airport during the festival adds a special ambience. Live music is a big part of his life, but so is radio, especially local radio. WDST is locally owned and operated and there are not too many radio stations like that. Gary feels WDST can serve the community better than stations owned by large media corporations. “Radio is important because it connects to the local community in ways that other media does not. It is also free, and easy to get, especially while driving in a car. Radio DJs also talk to the listeners and interact with the listeners, so the bond between radio station and its listeners is very special,” he explained. Gary Chetkof is a very important part of our community. His station and festivals bring people together through music. “I love all the festivals that I work on, although each one has a special meaning to me. Mountain Jam is the first festival that I created, so that will always hold a special place in my heart.” After all, music is a the heart of the matter, not even Tom Petty can break his heart. Joe Defino works for the Saugerties Central School district as a teacher. Since 1991, he has worked to create learning opportunities to give students the opportunity to explore authentic experiences with a real-world audience. The Just Print It activity combines print, video and web in a news gathering, publication and distribution to the world. You will find mistakes and errors, but it is those very same miscues which will forever influence the pursuit of perfection. Copyright © 2019 Just Print It.